Yes, Valentine's Day is a commercial affair evolving around chocolate, roses and spas. It doesn't mean it's not a good time to talk about love and style. Lately, I've been giving it some thought. Some females are fortunate enough to have stylish boyfriends who care about stuff like loafers, trendy colors and accessories (you know who you are, girls). Others, not in the luck, give in, a.k.a smartly adapt to their sweetheart's way of throwing a casual something over a wrinkled something else. 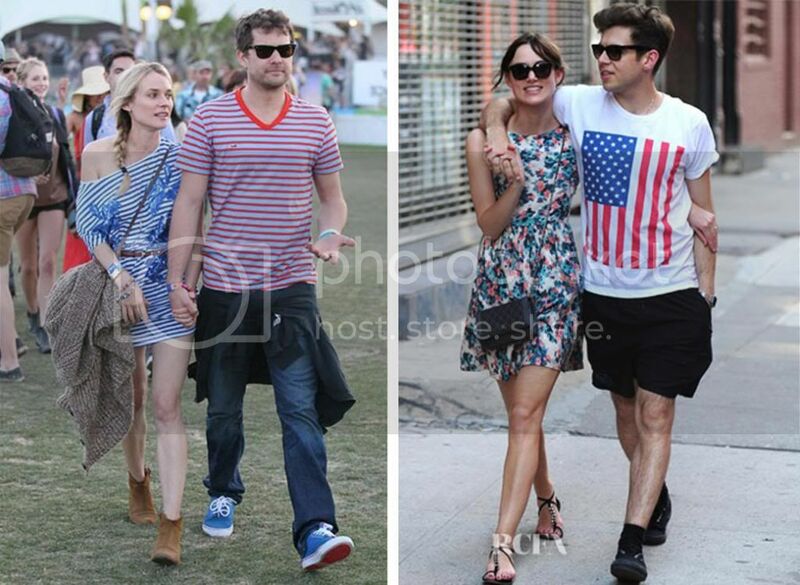 Some couples magically morph into each other's style-doubles with time. Whatever the circumstances are, there's often a sense of unity, an aura of conspiracy surrounding couples of true substance. If you look "together", after a certain point, you're probably meant to be. On the other hand, matchy - matchy public appearances can deceive - what may look, at first glance, as perfect love may be just un-romantic perfectionism. So it's always nice to keep a little bit of personality, a clash of patterns, a misunderstanding of occasions. Refreshing and fashionable, a little bit of a difference says "we're in love, but we're not robots". I was never a fan of people who take themselves too seriously and in love as in life – if you two can wear teenage cuteness together, her in a sundress and him in shorts, or roll with timeless stripes, simply be simple together and feel fresh and natural as you go – it must be love. Even when you wear the weirdest vintage dress you've ever owned, your partner should, ideally, think you're great. Even if he decided to leave the house in a bathrobe, essentially it shouldn’t matter. So if you dress up like a blanket, a cowgirl, or a belly dancer, just to run errands, and he's casually holding your hand, it's obviously right. Ah, the tricky couple picture. So many fail, so many never take a good one. If you two: a) do not have ideal bone structure, b) are not in a middle of a photogenic pregnancy, c) lack the ability to look British, or d) look like a brother and sister, caught in a weird moment, don't worry – after all, love is in the heart, not on the screen. A denim union will do. Happy Valentine's!